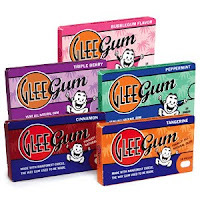 I was bound to notice Glee Gum, near a checkout counter. The first time I saw it must have been at a Whole Foods. I thought: "Wow, I have to try this gum made from chicle that was acquired from Sapodilla trees that grow in the rain forests of Central America!" My instant favorite was the Tangerine flavor until I tried Bubblegum. Glee also makes the only Cinnamon flavor I can tolerate. It is zesty but not too strong. Best of all, there is a Make Your Own Chewing Gum Kit. I have no doubt that one of these days I will revisit childhood and make my very own gum. Exciting!